We explored the plethora of art that Sicily has to offer in part one of this two part series, now we have the rest of what artworks you don't want to miss on your next visit to Italy's biggest island! Sicily has a vibrant contemporary art scene with many artists and galleries all around the island. But two must visit places which always host wonderful exhibitions throughout the year from while also are stand-alone beautiful and suggestive locations within the historical context of the cities of Palermo and Catania. The Fondazione San Elia, Palermo has two main homes in Palermo the first is in the fifteenth century Palazzo Sant’Elia, which gives the Foundation its name. 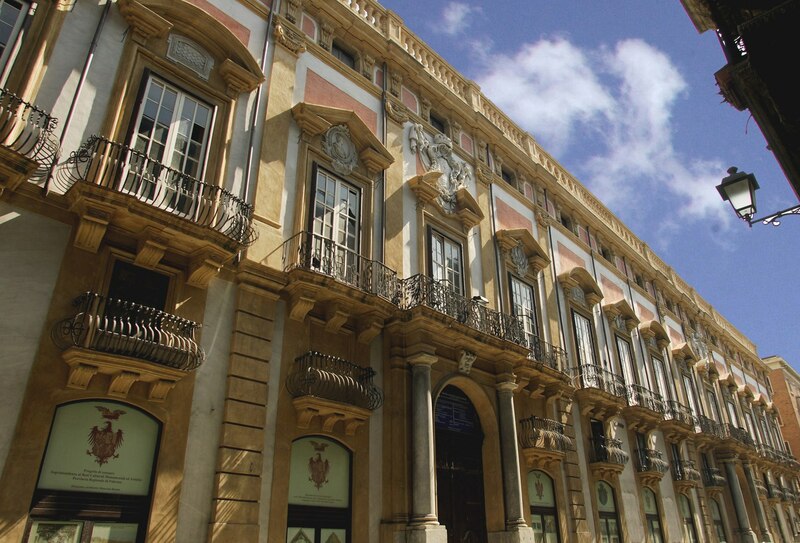 The Palace was renovated during the Spanish period when the Via Maqueds became the main street of Palermo. While the Loggiato San Bartolomeo on Corso Vittorio Emanuele, a few meters from the Porta Felice was an original part of a hospital built initially by the Confraternity of Saint Bartholemu in the first half of the thirteenth century. These beautiful historical buildings host numerous events organised by the Foundation of Saint Elia, who since 2010 has been at the centre of the city’s cultural life. After the close of the private Biscari Museum in 1927 one of the most important collections in Europe at the time and the acquisition of the Benedictine Collection at Catania, the city needed a new Civic Museum. So in 1934 the collections were moved to the Ursino Castel and reopened. Housed in an amazingly suggestive Norman castle built between 1239 and 1250 by Frederick the second the museum houses an extensive mix of archaeology, medieval, renaissance and modern art. In one of the most suggestive locations of the city looking out on the coastline of Sicily, surrounded by the sea, this unforgettable cultural centre is a fantastic place to visit. Sicily is also an excellent source of folk art from the suggestive decorative majolica ceramics of Caltagirone and Santo Stefano di Camastra to the ancient crafts of Sicilian Marionettes and decorative Sicilian Carts. 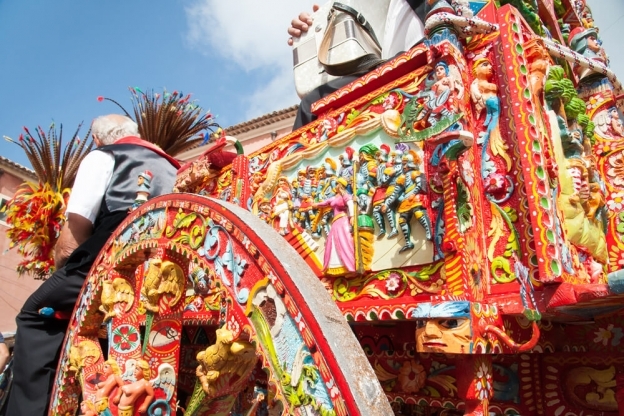 The Sicilian cart is an ornate, colourful style of horse or donkey-drawn cart native to Sicily. The crews that built carretti included woodcarvers, metal workers and painters. The woodcarvers carved the many panels that were often scenes from Sicilian and European history. The metal workers worked the iron, in wrought iron, which included highly decorated metal undercarriages. The Sicilian Carretto is made in several provinces in Sicily each with their own particular style. Today the carts are mostly confined to private museums and are seen rarely on traditional saint day celebrations, particularly in the Provinces of Catania and Palermo. The Pupi Siciliane are a particular type of puppet theatre, which emerged in southern Italy and Sicily in the early 1800s and are masterpieces created by the oral history of the island. Traditionally the Opera of the Puppets consisted of the theatrical performances of Frankish romantic poems such as The Song of Roland or Orlando Furioso. The production often reenacts medieval battles between knights and the Moors. In its early history, the puppets were seen as a subversive symbol of revolution reflecting the widespread desire for revenge and justice of the lower social classes. The Opera dei Pupi is connected with other forms of Sicilian voice performance including the “Cantastorie” and “Cantari” (singers of tales). There are several Marionette puppet theatres throughout Sicily where you can see shows and go to exhibitions dedicated to the characters behind the plays including Figli D’Arte Cuticchio (Palermo), Museo Internazionale delle Marionette A. Pasqualino (Palermo), Marionettistica Fratelli Napoli (Catania), Opera dei pupi di Turi Grasso at Acireale (Catania) and many more. The art of mosaics in Sicily reached its apex during the middle ages as the Normal Kings brought skilful craftsmen from Northern Africa to decorate their own personal chapels and cathedrals dotted throughout the island. As a result, Sicily has some of the most spectacular mosaics in the world, decorated with semi-precious stones and gold inlays. The three most famous include sites at Monreale, Cefalu and Palermo. The Christ Pantocrator decoration is typical of these Sicilian mosaics, the giant Christ figures hands are nearly two meters tall, and his face is designed to create the optic illusion that he is looking directly at you no matter where you find yourself in the Norman church at Monreale. Outside of Palermo the cathedral at Monreale is regarded as the most beautiful of the Norman churches in Sicily. The mosaics were made with 2200 kg of pure gold. Craftsmen from Constantinople were employed to expedite the work. The Byzantine mosaics are among the most magnificent in the world. While Work on the Cefalù Cathedral was begun in 1131, under King Roger II and was consecrated much later in 1267. 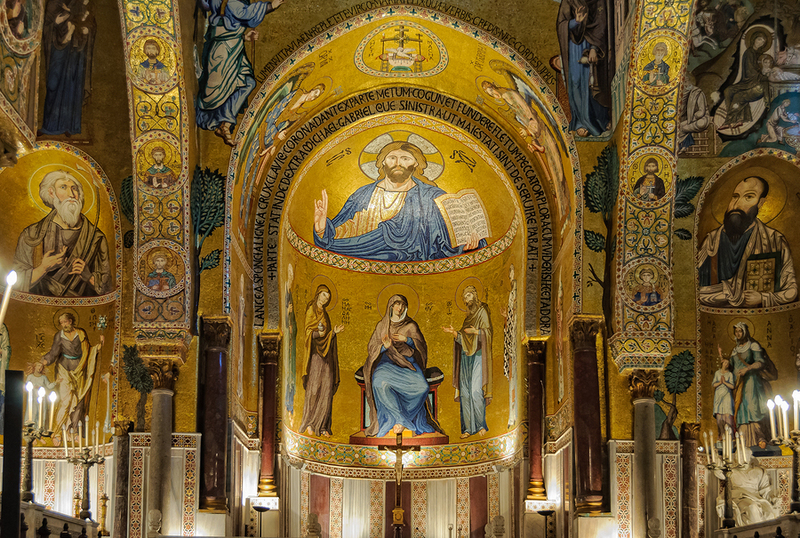 The mosaics inside started in 1145, are fewer than those at Monreale. But they still dazzle, especially given their more austere surroundings. The Palatine Chapel is the royal chapel of the Norman kings of the Kingdom of Sicily, located on the second floor at the centre of the Norman Palace in Palermo. The chapel is a symbol of multi-cultural cooperation. As the craftsmen from three different religious traditions worked alongside each other. And is nearly completely covered in well preserved golden detailed Sicilian mosaics. 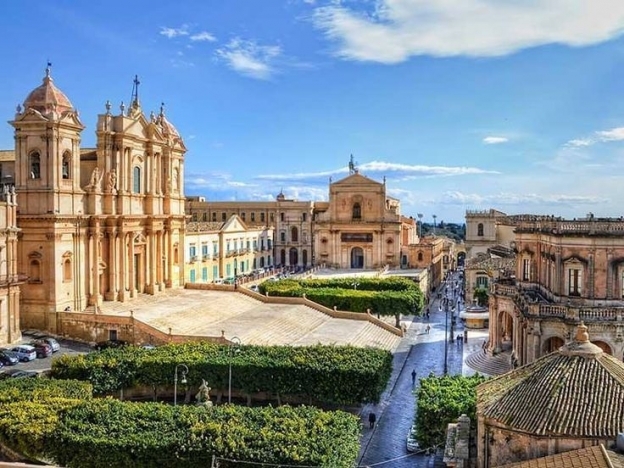 The eight towns in south-eastern Sicily: Caltagirone, Militello Val di Catania, Catania, Modica, Noto, Palazzolo, Ragusa and Scicli, were all rebuilt after the 1693 earthquake on or beside existing towns which were nearly completely destroyed. They represent a considerable architectural achievement which kept up the late Baroque style of the day. The rebuilding, restoration and reconstruction of these communities resulted in the creation of an exceptional group of towns, all reflecting the late Baroque architecture of the 17th century in all its forms and applications. Varying in size and scope each village in the Val di Noto has its own character, filled with unusual architecture, art and style. A meandering drive through each one is like revisiting the Baroque period. 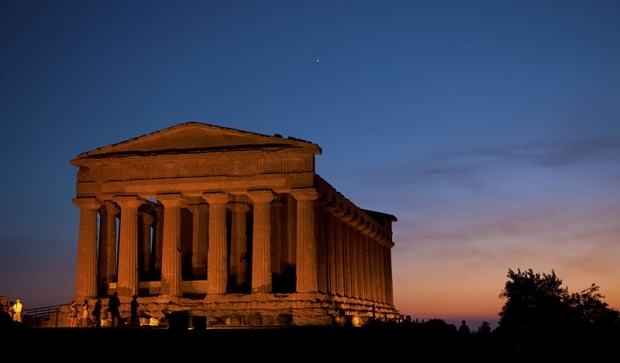 The Valley of the Temples at Agrigento is undoubtedly the most important testimony of the ancient, classical culture of Sicily. It brings together the temples of gods, goddesses, as well as suggestive burial sites, necropolis and sanctuaries. The Parco Archeologico del Valle dei Templi di Agrigento is now a protected archaeological park which offers easily accessible routes through a series of ancient sites. Including the suggestive ruins like the temple of Castor and Pollux (Dioscuri), the temple of Olympian Zeus (Jupiter), the temple of Concordia, the temple of Heracles (Hercules), the temple of Aesculapius, the tomb of Theron, the temple of Vulcano and the temple of Juno. 14) The English in Sicily: Casa Cuseni, Taormina. The English have always been fascinated with Sicily, and there are many examples of historical figures who were actually English men and women who relocated to the island. From British Bishop and Saint Thomas Becket in the middle ages, Marsala wine producers Ingham and Woodhouse in the eighteenth century to the wealthy Whitaker family with their luxurious homes at Palermo and Marsala. 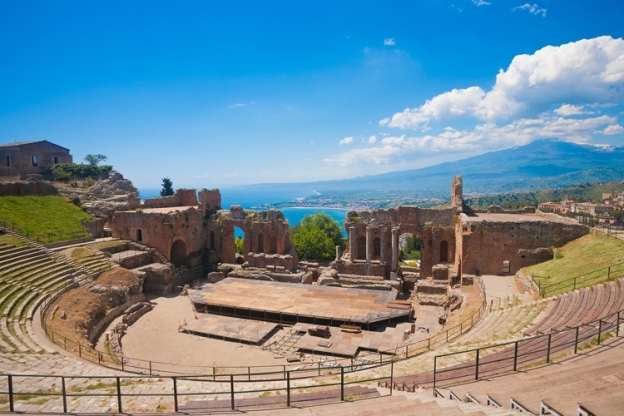 In the twentieth century, the English discovered the idealistic town of Taormina in the province of Messina, which seemed to draw many people to it. Today it is a Mecca for tourists but towards the end of the 1800s and into the beginning of the following century many Englishmen choose it to be their home. British artist Robert H. Kitson bought land outside of what used to be a small Sicilian village and began an ambitious project to build a luxury villa and garden. At the time Kitson was seen to be a madman as there wasn’t even a road out to the distant plot of land and he was totally isolated from the main town. But thanks to his vision and with the help of his niece Daphne Phelps who inherited the home after world war two, we now have a beautiful palatial house, exotic botanical garden, art gallery and historic bed and breakfast which has hosted an array of famous artists, actors and writers. Daphne Phelps took her uncles home, restored it and turned it into an exclusive guest house, inviting and hosting everyone from Picasso, to Greta Garbo and Henry Faulkner. Today a visit to Casa Cuseni gives you a sense of the elegance and style the English brought to Sicily, the art and architecture of Kitson who was a well-known landscape artist and designer in Britain. The house is now owned by the city of Taormina which offers guided tours by appointment which reflect the integral part it has in the landscape of Taormina and Sicily’s history. The art sculpture park at Castel di Tusa Fiumara d’Arte is a succession of large outdoor sculptures which are interwoven with the natural landscape and the layout of the terrain looking out to the sea. Catching the train from Palermo towards Messina or vice versa you will accidentally stumble upon a giant blue picture frame which looks onto the railway line both a puzzling and intriguing piece of art which was seen as quite a controversial addition to the panorama. 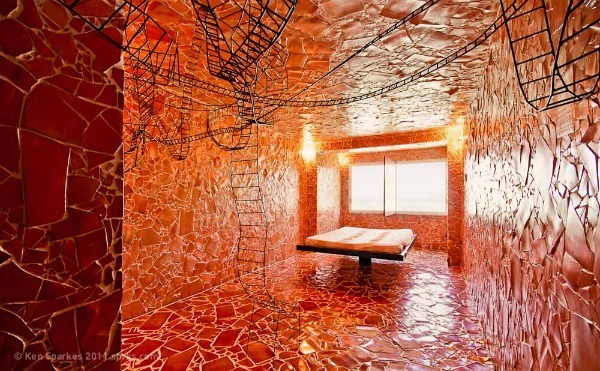 The connected art hotel is also one of the most fascinating artistic locations on the island where every room has been decorated in a different style by numerous contemporary artists. 16) The Sistine Chapel of Sicily. The church of San Domenico at Catelvetrano in the province of Trapani houses an elaborate work belonging to the style of Sicilian Mannerism which is considered to be the first step towards the Sicilian Baroque style. Castelvetrano on the Tyrrhenian Sea was founded in the Middle Ages, in 1299 it was given to the Tagliavia family. The Church of San Domenico was built in 1470 by Giovan Vincenzo Tagliavia, lord of Castelvetrano. Prince Charles Aragon Tagliavia wanted the church of Castelvetrano to be his own personal church, so he called on one of the most famous stucco artists of Sicily, Antonino Ferraro da Giuliano, who had already worked in other sacred buildings. 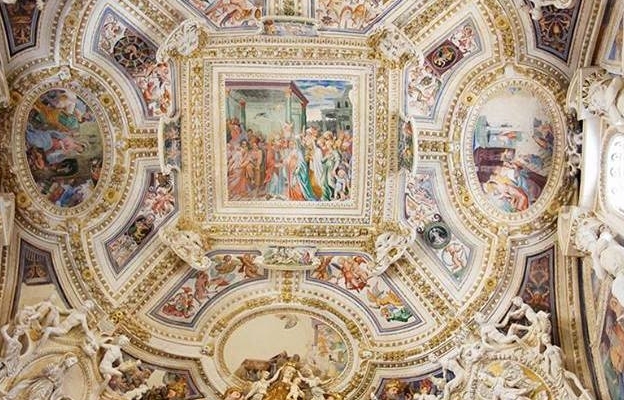 Given free reign between 1577 and 1580 the artist created what is still known as the Sicilian Sistine Chapel. The decorative archway over choir chapel at the heart of the church is a masterpiece of stuccos depicting “the tree of Jesse”, a forefather of the great biblical dynasty of King David, his son and finally Jesus Christ. Over the years, other artists took over the embellishment creating this amazingly elaborate jewel of Sicilian art. After four centuries of magnificence, the church was severely damaged during the earthquake of Belice in 1968. After forty-six years of restoration work, the stuccos and marbles of the church were revealed from behind the scaffolding to be enjoyed by visitors. Today the church is no longer opened daily but by appointment only and tours are hosted by volunteers contacted through the locally run tourist board (pro loco). Probably one of the most famous, loved and mysterious Italian Renaissance artists is Caravaggio, who visited Sicily briefly in the early 1600s before his mysterious death in Tuscany. It is believed that Caravaggio landed in Sicily while fleeing from the Knights of Malta who were trying to kill him after being accused of murdering a man in a brawl. So his time in Sicily was very brief, yet because of his fame, he was able to complete a few critical commissions on the island. At Syracuse Caravaggio, he painted the Burial of Saint Lucy, the patron Saint of the City. The massive canvas is in the church of Santa Lucia alla Badia on the Piazza Duomo. 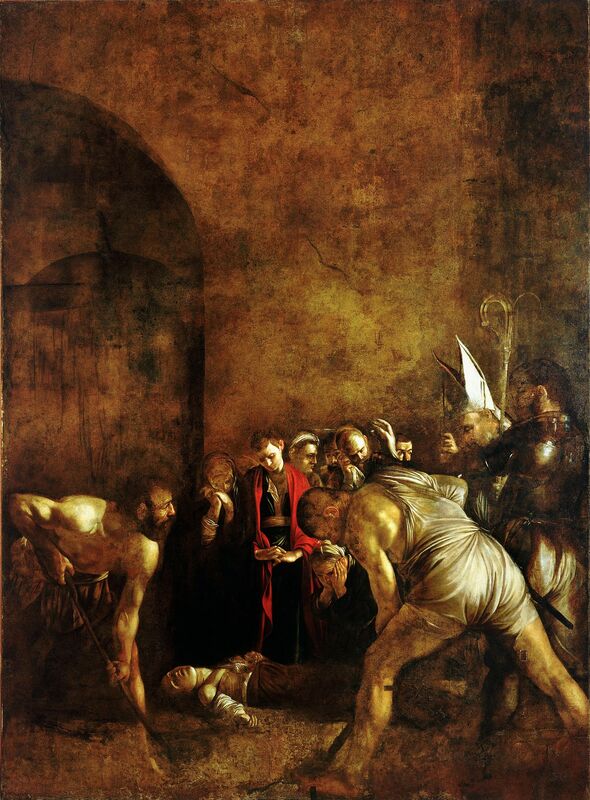 The very dark, violent and sombre masterpiece shows the saint’s burial after her martyrdom. Up until a few years ago, the artwork was sadly neglected and in bad condition, but thankfully after restoration, the work has been saved from any ulterior degradation but unfortunately, the damage is noticeable, yet the expression and hand of Caravaggio is always present. While the regional Museum of Messina proudly houses Caravaggio’s Raising of Lazarus and his Adoration of the Shepherds which offer valuable insights into the way this masterful painter worked. Caravaggio vividly expressed crucial moments and scenes, often featuring violent struggles, torture and death. He worked rapidly, with live models, preferring to forego drawings and work directly onto the canvas. Caravaggio's innovations inspired Baroque painting, and the way he incorporated drama with his chiaroscuro use of light with an evocative psychological realism is a fantastic thing to witness while viewing his works.